HIDEWEAVER is a Heavy Metal outfit from Forli, Italy. This venture was yielded from the ashes of a band called THEMSELVES, founded by guitarist Fabio Lanyux Rossi in the late nineties. 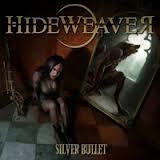 Just recently the Metallers released their new “Silver Bullet”, via EBM Records. “The Same Old Song” is surprisingly opening with a Hard Rock vibe similar to BONFIRE or WHITESNAKE with an amazing melodic singing. After the intro, it is a proceeding of a classic Metal number with a powerful peak shredding solo. The same was with “The Scarlet Whore”, a classic Hard Rock into then converging into a Heavy / Power Metal onslaught of melodies and fury, quite catchy. Title track “Silver Bullet” delivers the additional sound of overhead keyboards integrated well with the song's Euro Power Metal spirit. “Opus Die” displays a different orchestration with a blending of Progressive an Power Metal, highly dynamic rhythms that carved RHAPSODY OF FIRE into my memory. This song essentially presents the band's great instrumental talents along with the impressive vocal act of Nando Dessena. “Shades” is one of the album's less edgier tracks, a bit more subtle, yet more melodic, the striking singing, reminds me a little of the band PRIME TIME. “Wait Until Dark” hails forward as a bit Gothic, a small surprise, yet it has a stronger pattern of sound, catchy melodies and IRON MAIDEN oriented riffs. Worth listening are the grand guitar solos on “Wash My Tears Away” and Heavy meets Power Metal of “Of Beauty and Vanity”. “Eyes Open Wide” is Euro driven for sure, a bit progressed, heavy as hell clinging a bit to SINBREED with its energy & passion. Summing up, HIDEWEAVER is quite a Heavy Metal entity. I really enjoyed the variations of classic Metal genres, including Hard Rock and AOR this making this album interesting. HIDEWEAVER has a big potential. I'm interested what guys will offer to listeners in the future and I can't wait for some new tracks.